The Adventure of the Seas encountered propulsion problems last week and, eventually, a total failure on Saturday night, after the cruise ship’s "fixipod" leaked oil and the ship lost propulsion. The ship limped back to San Juan on Sunday with great uncertainty whether it could possibly be repaired in time for it to sail. The ship is scheduled for a drydock at the end of the month, but it appears that Royal Caribbean decided to try and do a quick-fix of the damaged "fixipod" and squeeze in one more cruise to avoid having to refund their several thousands of passengers millions of dollars in refunds. Families who had flown to San Juan to board the Adventure were not told of the propulsion issues and found themselves standing in a long line in the hot sun while the cruise line’s public relations department said nothing. As of this morning (Monday), the ship has still not sailed. While the Adventure of the Seas saga was unfolding, the Navigator of the Seas was delayed returning to port by an oil spill caused by a collision between a ship and a barge. Families who had driven and flown into Houston to make the cruise where not advised of the oil spill or the delay embarking the ship while the Royal Caribbean department remained quite. Meanwhile the Carnival PR department was routinely posting updates on Twitter and Facebook about the problem which its ship, the Magic, faced with the oil spill. Carnival maintained a centralized "Frequently Asked Questions (FAQ)" on its website. It timely notified its guests that the cruise aboard the Carnival Magic would be delayed until Monday and that they should locate a hotel and get a good night’s sleep. By early Sunday afternoon, the Royal Caribbean passengers began openly complaining on Twitter and Facebook about the cruise line’s refusal to keep them up to date. A public relations nightmare was unfolding. Numerous passengers and family members began bitterly complaining that Royal Caribbean was not notifying them via email, test messaging or telephone, and the cruise line was not utilizing its Twitter or Facebook feeds. Royal Caribbean has a public relations account of Twitter, called @RoyalCaribPR, but it had remained silent for the psst 48 hours. People calling the cruise line were placed on hold, or the service representatives didn’t know what was going on. It was as if the entire customer relations department has outsourced to a distant village in India. The passengers in San Juan were congregating in long lines in the hot son without water or food (photo left, via @_DanielnPearson). There was reportedly a single restroom with long lines. People were suffering, particularly the elderly. One passenger sent me a photo of the long lines via Twitter. One passenger commented on Cruise Critic that Royal Caribbean "is refusing water and people are leaving in ambulances." Some passengers reportedly collapsed due to the heat and lack of water. And @It’sYourWorld tweeted a photo (photo below right) of a San Juan ambulance which arrived at the port to attend to one of the passenger trying to board the ship. Meanwhile, Royal Caribbean’s Facebook page said nothing about either the Adventure or the Navigator. While people began demanding an update on Twitter, Royal Caribbean posted a photograph of a beautiful tropical port of call (photo bottom left). At a time of crisis with customers begging for information, Royal Caribbean was clueless. It was trying to sell cruises with images of paradise when people in the sun needed water. As the afternoon dragged on into the evening and night, the passenger attempting to board these Royal Caribbean ships were kept in the dark. When Royal Caribbean finally began to tweet, its tweets were meaningless. One tweet it made over and over said: " We will provide more information . . . as information is available." Hundreds of passengers and the usual "Loyal-to-Royal" cruise fans began tweeting every few seconds. Of the hundreds of tweets, here are a few. A cruise social media expert said: ‘Hey @CCLSupport any way you can help out @RoyalCaribbean on their updates? They don’t seem to be taking your lead :)" He added another tweet: "@RoyalCaribbean’s last tweet was promo for Ibiza & @RoyalCaribPR’s last tweet was Friday. #FAIL"
A woman concerned for her elderly parents tweeted: "@RoyalCaribbean when can incoming guests check luggage? Senior parents (one disabled) have been up since 4am. They are exhausted." Another woman from Texas tweeted: "My mom received no email or call updates. Found all the update info on Twitter. Pathetic!" A man from Ohio tweeted: "@RoyalCaribbean why are your offices closed when you have 1000s of passengers waiting for information about boarding the Navigator of Seas?" A cruise fan from Denver tweeted: "@RoyalCaribbean I understand the oil spill is out of your control but do you know how to use technology to communicate with your passengers?" He added: "@RoyalCaribbean = confusion." If as reported, no water or accommodations for elderly and special needs passengers were made while waiting to board; that’s another major failure given the huge amount of time the company had to prepare for what they knew would be a problem. A hotel ballroom and shuttle could have been arranged cheaply. This is completely unacceptable and another huge black eye for the Royal and the cruise industry." You can read the Cruise Critic comments here. Throughout Sunday afternoon, we received emails and comments on our blog and Facebook page asking for basic information about these two Royal Caribbean cruises from passengers at the ports, travel agents and concerned family members at home. A cruise line has a major PR problem when guests and travel agents are ignored and have to seek information from a maritime lawyer rather than a cruise representative. We directed a number of people calling us to the Carnival updates about the Galveston situation and also sent the link to the webcam at the port of Galveston so that they could see when the Navigator finally arrived in port (photo top right). It still remains uncertain whether the Adventure of the Seas will sail today. The Royal Caribbean PR Twitter feed @RoyalCaribPR remains silent. The Royal Caribbean main Twitter page @RoyalCaribbean has offered no updates for 14 hours. The page claims that it offers "inspiration and information from the official sponsor of WOW. Living the #cruiselife 24/7." Hardly. The problem here is that cruise lines like Royal Caribbean try and squeeze their ships (and employees) to make every dime possible. It could have decided to take its crippled Adventure of the Seas out of service a week early for dry-dock but instead loaded the new round of passengers aboard to avoid paying a hotel for the night or refunds for the missed cruise. This is not Royal Caribbean’s first PR blunder in San Juan. 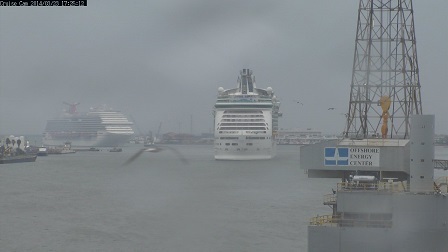 In August 2011 as a hurricane headed to the island, Royal Caribbean Serenade of the Seas sailed 6 hours early. But Royal Caribbean did not contact its guests via the emergency contact information about the new itinerary. It didn’t provide the passengers, who arrived in San Juan to find that the ship had left, with hotel rooms. It abandoned its guests in the middle of a hurricane and didn’t bother to tell them. Super cruise fan Carolyn Spencer Brown, editor of Cruise Critic, expressed outrage in her blog Bad Weather Blunder: A Lesson in Cruise Crisis Control? "This takes my breath away. And it’s not about the fact that it didn’t offer to pay for hotels and flights . . . . It’s about dropping the ball in a risky situation. Clearly, I’m not the only one who is shocked at Royal Caribbean’s lack of responsibility to its customers. On Cruise Critic’s forums, its blog, and its Facebook page, travelers are incredulous." One of the continuing criticisms of the cruise industry is that it may be skilled at marketing fantasy images of idyllic cruise vacations but it is not prepared when disaster strikes one of its increasingly gigantic cruise ships. It’s clear that Royal Caribbean has not invested into the infrastructure of its crisis management department and developed policies and procedures to effectively communicate meaningful information in real time. If Royal Caribbean can’t handle a weekend when two cruise ships are delayed, one for an oil slick and another for a known propulsion issue, do you think that it can communicate effectively when a fire strands either the Oasis or the Allure on the high seas in rough weather or, God forbid, a huge ship sinks at sea?